In the previous post we setup a page to add an invoice, adding the controller to manage that process. We explained in a bit more detail about the difference between factories and services. Hopefully, the explanation helped and made sense. Anyway, today we are going to go and create our Azure Application, talk about setting up ADAL.JS. This will get us ready to create the Visual Studio 2015 project which will host the MVC Web API. This will be how we communicate with the Azure Document DB database. Firstly, when ever I do this, I get it wrong and cannot remember what I need to do. Before we go into the detail, lets briefly explain what Azure Applications are and what it will do for us. Also, I need to explain a bit about the design of the Azure Applications and how we are going to create two Azure Apps, one for the Angular bit and another for the Web API component. Azure Applications are entities that are associated to an instance of Azure Active Directory. They can be found in https://manage.windowsazure.com by clicking the Active Directory heading on the left hand side. Once we have loaded Active Directory, then we click on the name of the Active Directory item in the list. 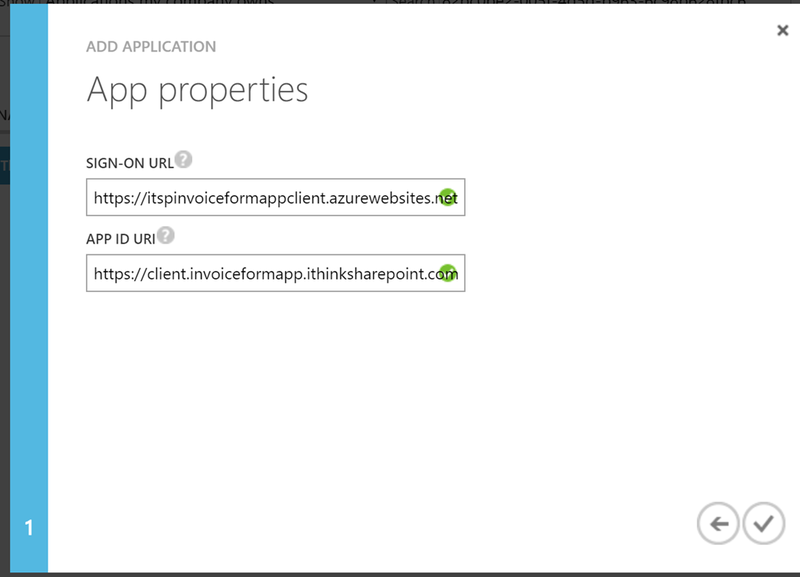 The “Applications” tab contains the applications that you have available in your Azure AD. Applications have various attributes including a Name, Sign-On URL, Client ID, App Id, Reply URL and also provide you with a way to manage permissions that users have when using this application. Also, it is possible to assign whether someone has access to an application as well. By default, this capability is switched off. We will explain the configuration in more detail shortly. Why are we creating two applications? The two apps are one for the Web API service components and one for the Angular SPA Web App component. This allows us to manage who can access the Angular application separately as to who can access the Web API. Also this helps to keep the Web API component more secure as an app has a key which allows the application to be accessed and configured. By having two separate keys we won’t have the situation that the application cannot interfere with each other. Also the nature of an Angular component means it is client facing and so slightly less secure that the Web API component. As we have support for new clients, then we can start creating new applications for each of the clients. Anyway, lets get to creating the Azure Applications in our Azure Active Directory. To create the application, I browsed to https://manage.windowsazure.com and logged in with Work account. Browsed to the Active Directory icon and clicked the link, next I opened my Active Directory Domain “iThink SharePoint”. From the footer, I clicked “Add” and chose “Add an application my organisation is developing”. Next we need to provide the Sign-On URL and App Id Url. The Sign-On URL is the start page when the application needs to login and the App Uri Id, is the unique URI that that the application is identified with when trying to authenticate with the application. The App Id Uri, should not be confused with the Client Id which is a GUID that we use to identify the application later on. Now we click the tick box and the application is created. Within our application we can see what the Client Id is by clicking on the Configure tab. The example of the app shown below has been deleted but shows you all the settings. The Reply Url section will need to be populated with the URLs that we are going to use to debug and test the application. These URL are trusted by the application as a URL that can be redirected to as part of the OAuth flow. You can also upload a custom logo here, maybe we will do that when we get a bit further with the development of the app! The section as the bottom is the Application permissions which we will cover this later. We can use this to download and upload the application manifest. This can be used to configure additional application settings, that cannot be configured by the UI. An example would be , setting up custom application permissions. More on that later. Now we have created one application, I could create one for the Web API application, but Visual Studio does a great job of setting these up so we will let it do its magic once we get to the Web API project configuration. So now that we have the application, we need to setup Angular to use Adal to login. I want users to login to the Angular client before they can use it. 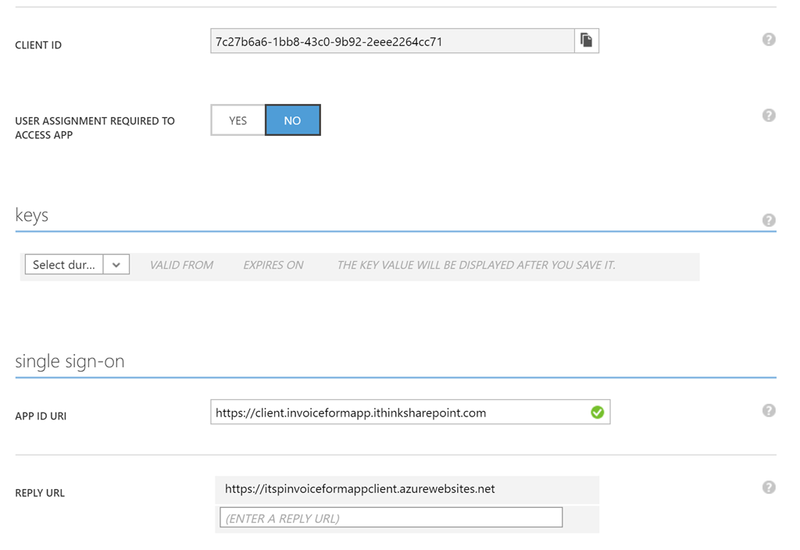 This library allows us to integrate our application so that we can authenticate users with Azure AD. As I have mentioned in my first post, we are using Adal.JS and the man with the knowhow is Vittorio Bertocci who has a great post, Introducing ADAL JS v1. Adal.JS is packaged up for Angular as a bower package, so can be installed using bower install adal-angular. I have already done this in the client environment post. Now that we have the adal-angular package installed in the solution, we can start to integrate it with our application. First we need to add the Adal.js library so that it is referenced in our application. Next, we need to tell our Angular application that it is a dependency and then finally we can start to configure Adal. This will ensure that it knows about our application and where it is hosted. Adal Angular comes with two versions of the library, a minified version which is found in /bower_components/adal-angular/dist/ folder and a debug/dev version which is in the folder /bower_components/adal-angular/lib/ folder. I am linking to the debug/dev version which is not minified but allows us to be able to debug what’s going on! Once we have the dependency, we are ready to setup Adal.JS configuration. How exciting! To initialise the Adal,JS library it needs to know the following information. tenant – this is the domain name for your tenant, so I have the domain ithinksharepoint.com so that is what I use it, but it might be something like company.onmicrosoft.com if you do not have a custom domain setup. client id – this is the GUID that we saw when setting up the Azure Application, it is sometimes referenced to as the App Id. endpoints – we will talk about these later but they allow us to map a URL endpoint to resource, so that Adal,JS can authenticate against the endPoint correctly. When I was looking at where to store this information, I did originally have it hardcoded into the /app/app.js file. However, after more reading and thinking I decided on another approach, using Angular constants. To ease the configuration for the app, I decided to keep it all in one place and created an object stored as a Constant. This will be part of the configurationService module which we will complete later on but let’s create this constant first. Please note that the clientId is not a valid one, but just shows you the value that you need to use. Finally, we need to add the reference to the script in our /app/index.html file. As mentioned previously, there are some things we need to tell Adal.JS before it can do its magic. These are the instance, tenant and CliientId settings. The following changes were made to the /app/app.js. file. Having Adal.JS installed also allows us to configure which routes require authentication, so we need to modify those too. This is achieved by adding the requireADLogin: true property to the route. Please refer to the app.js gist above for more info. Now that we have the Adal.JS configured in our application, I thought I better handle authentication when the user hits our homepage. So the following changes were made to the /app/contollers/invoiceControllers.js for the listInvoiceController. Also, the following changes were made to list-invoices.html. The changes use ng-hide to show the login button when the user is not logged in. Note: whilst testing this I tried to upgrade to use 1.0.10 of Adal.JS but seem to have an error related to anonymousEndpoints. I am going to look into this but all was fixed when I reverted back to v1.0.8 of Adal Angular. 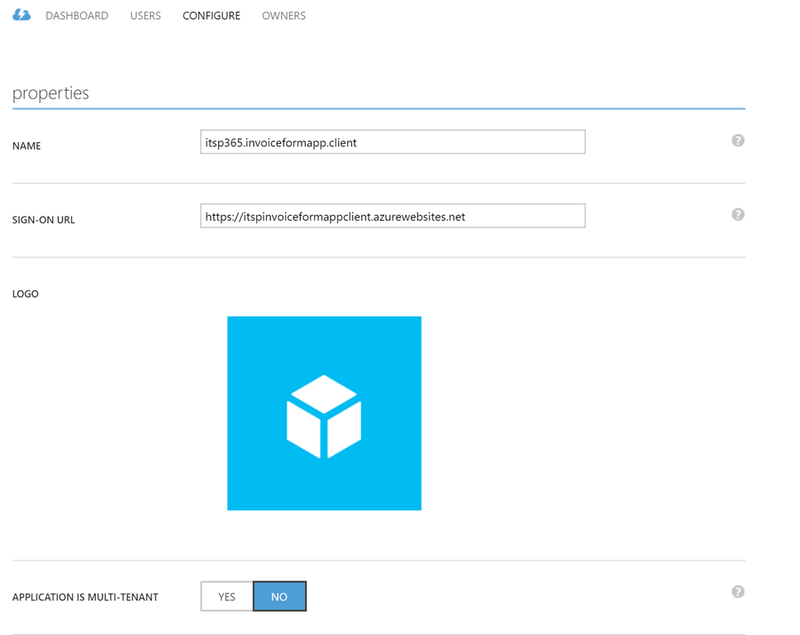 A couple of problems that I had included a fix to the Azure Application to allow add the redirectUrl: http://localhost:8080/app/index.html to the list of Reply Urls. So we are now at at the end of the session, thanks for reading. We have Adal.JS integrated and we have authentication, we are ready to start bring in the WebAPI MVC side. We can move the Invoices to be held in the API and start allowing us to create, edit and view the invoices. I hope you find the information useful, please let me know if things are unclear or you need more information about anything that I have talked about. 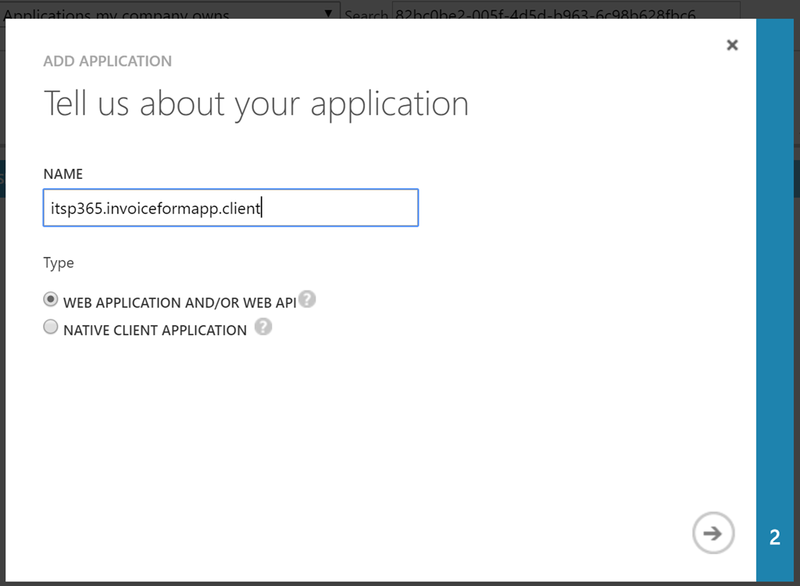 In my previous post: Dev Diary Entry 1: Azure Web App with MVC WebAPI, Angular and Azure DocumentDb, I introduced the Invoice Management App that I am planning to build. For complete transparency, the application that I am talking about building has been in development for a week or so now. So, as I write this I am playing catch up. I have been writing down all the problems that I have had and how I resolved them. My aim is that we will quickly get up to date so that I am coding and then I can quickly write about what I did. Today, we are talking about setting up Visual Studio Code and Visual Studio 2015 to host my applications. Remember we are building two components, the Angular client application in Visual Studio Code and the MVC Web API component using Visual Studio. Developing in Visual Studio Code is quite different to using Visual Studio, the team at Microsoft are doing a great job at improving the application but it does feel very unfamiliar to me who has been using Visual Studio for a rather long time. Anyway, I downloaded VS Code from http://code.visualstudio.com/ and installed it on my machine. I am developing on a Surface Pro 4 with Windows 10 x64. So the instructions provided are for Windows but it is pretty similar for MAC OSX and Linux. The next step, was setting up the environment, I had spoken to a few people and read a few posts and the way to go with VS Code was using Node.js tooling and the Node Package Manager, npm. Node provides a few lightweight services which we can take advantage of when developing. 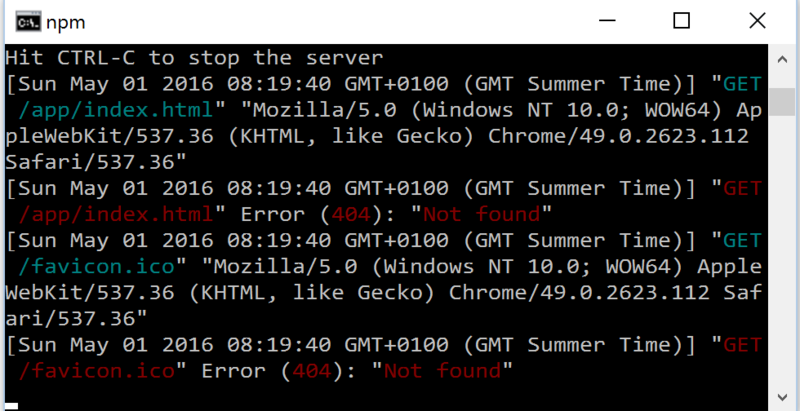 The one that I make most of is the built in HTTP server, but more on that later. NPM or Node Package Manager provides a fantastic way of downloading, installing and keeping your dependencies up to date. I guess the name came from Redhat’s Package Manager or RPM. To be fair it is also like NuGet which the .NET world have been using to keep their dependencies in check. So I downloaded and installed Node from https://nodejs.org/en/ and choose the latest build which was v5.6.0, I see that version v6 is out as I write this. The download is an MSI so was a quick simple install. The command calls npm telling it to install a package called npm with –g which means to install it so it is available globally. The other tool that seems to be great at dependency management is Bower. Now, I had a hard time working out what the difference was between Bower and NPM. Why do I need both. Well Bower seems to be better at installing and configuring the client side components and NPM for the server side components. One of the reasons that I have chosen Bower is to be honest a lot of tutorials use it. Now, this is something that I will look into a little later on the project but I want to get up and running. There do seem to be a lot of alternatives such as Browserify and Webpack. So this is my first project using Angular, I hear people talking about it all the time! As I was researching into the product more it became embarrassing to see how long its been out before I have had a go at using it! One of the chaps speaking about this stuff from the SharePoint world is Andrew Connell via his blog. He has a great amount of content which I found really useful. As I mentioned in my previous post, I have been reading up on Angular via their documentation pages. I also have been listening to Scott Allen’s AngularJS: Getting Started on Pluralsight. As a developer, I need help with design so I have decided to use Twitter Bootstrap and fortunately this is quite easy to include in your project. I am sure that you have used Bootstrap more than me! However, Bootstrap is a framework which provides a grid based system for defining responsive designs based on having different css classes for different screen sizes. I have to say I am always amazed what front-end developers can do with Bootstrap, I am sure in time that it will become second nature. Yeoman is like File->New Project in Visual Studio. It is pretty cool actually and allows you to create or use pre existing templates to make the project scaffolding. I did look at this and various templates but I found them complex and they started to pull in a lot of stuff which I did not know about. So to kept it simple, I haven’t used Yeoman as I wanted to learn how to build the project from scratch rather than have a tool do everything for me and I then don’t understand my dependencies. I am sure that I will change my behaviour next time once I understand how everything fits together. Now I know that I am going to be using Azure Active Directory as my authentication and authorisation mechanism. I have been following Adal for a while and the go to guy is Vittorio Bertocci, he has some great posts on all things ADAL. The article is great and talks about how to install the framework using Bower and then provides examples including one for authenticating your application with Angular! Of course we need jQuery, I don’t think this framework needs any introduction. Ok so now I have talked about all the bits and pieces that I am using for the client side of the application, I will try and explain the steps that I took to create the project for Visual Studio Code. So, to create the Visual Studio Code project you need to create a package.json file. This is the equivalent of a Visual Studio csproj file for Visual Studio C# Projects. It contains the version number, name of the project, description and also it has scripts section where you can define commands to perform actions when developing your application. This will start Visual Studio Code in the current directory which will cause Visual Studio code to read the application information created so far. Now we have the project created next it is time to bring in our dependencies. This will give us a better look and feel than I could do! So, we have the Angular and Bootstrap stuff installed that I thought we needed. I am sure that I will be adding more folders etc but that gave me something to start with. So one of the tips that I picked up from the node.js documentation was how you can create tasks with NPM. I was a little confused by this to be honest but after a bit of investigation I found out that I could modify the package.json to configure these tasks for NPM to be able to use. This will start a web server and fire up the browser taking me to the homepage! So in the next episode, we will actually start develop something. I was pretty excited to try out Angular so I just started to build the application using client side data. So we will cover that. I hope you can join me for the next episode.